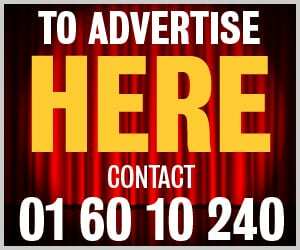 ST BRIGID’S Eoin Kennedy defied his years to overcome the challenge of Meath’s Gary McConnell in the semi-final of the senior singles in Croke Park. With Kennedy giving over ten years to his opponent, it was expected the talented McConnell’s youth, strength, speed and firepower would push Kennedy to the limit. It was clear from the start, however, Kennedy had a clear game plan, concentrating on perfect overhand serves down to McConnell’s left, forcing difficult returns that were either killed or driven down the sidewalls. Adopting a more offensive approach than previous years, when he would wear down opponents by sending them on a tour of the court while maintaining centre court positioning, he was now going for his kills at the earliest opportunity. His more aggressive approach meant he wasn’t drawn into long, energy-sapping rallies and right from the start he gave an exhibition of precision killing. Trailing 2-0 in the first, he quickly regained the initiative driving to a 6-2 lead before McConnell regained the serve. He was quickly taken out and the next few rallies went Kennedy’s way as he forged into a 12-3 lead. McConnell pulled back to 7-12 before Kennedy again brought down the hammer to lead 16-7. Both players swopped hands without either gaining aces until Kennedy broke the logjam to lead 17-8. McConnell drew back to 9-17 before Kennedy again scored to lead 18-9 while following a long rally McConnell drew back to 19-11. Two superb kills for Kennedy resulted in the first game 21-11. It was clear from the outset of game 2 that the sting had been extracted from McConnell as Kennedy raced into a 5-0 lead before losing hand. McConnell scored an ace but Kennedy took him out and dominated the next ten minutes to build a substantial lead, frustrating McConnell who tried his best but was clearly playing for second place. With Kennedy’s excellent retrieving and superb killing he was pushing McConnell around the court and undermining his confidence. Known as a talented front-runner who can play fantastic shots when in the lead, McConnell was kept on the back foot and Kennedy succeeded in dominating the second game to run out an easy winner 21-4. 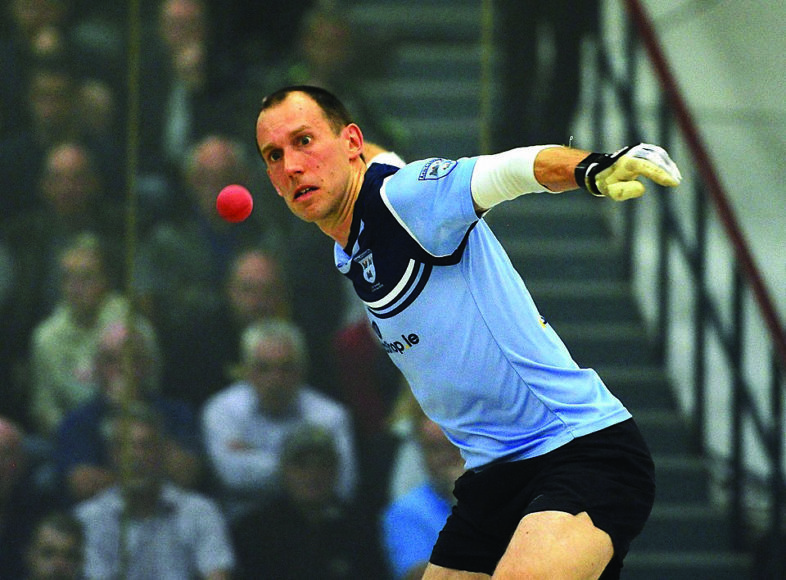 Following this display, Kennedy can now look forward to Saturday, September 29 when he again faces Westmeath’s Robbie McCarthy in the All-Ireland Senior Singles final. 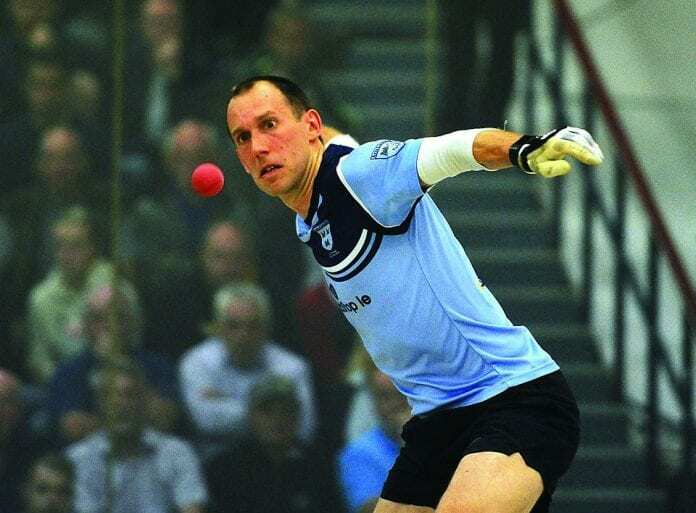 Kennedy will be attempting to win an astonishing 10th Singles final to round off his outstanding handball career total of 31 Senior titles across all three codes of handball, singles and doubles.